The lifestyle choices we have made over the years has depleted natural bio-electric energy from our water, food, and environment. Because many people in modern society are overworked and let their bodies get run down, we are all generally running on less 'fuel' than what we need to maintain optimum health, energy, and overall vitality. Our inner batteries are running on empty, so-to-speak. Our body's energy, as well as that of all energy on earth, comes from negative hydrogen ions. They are necessary for life, yet we are getting fewer and fewer from our air, water, and food, due to pollution and poor diets. Welcome the Q2! The Q2 Energy Water System transfers negative hydrogen ions in a bio-organic form to your body, through water. B.E.F.E. (Bio-Electric Field Enhancement) is the basis for the Q2 Water Energy System. It is the latest in home-based systems developed by Q-Tech Laboratorie s as an aid for relaxation and well-being. The Q2 is based upon a new quantum resonance theory called Q-Mechanics that alters an external source of artificial energy into an energy format that is similar in nature and compatibility to that of a body. 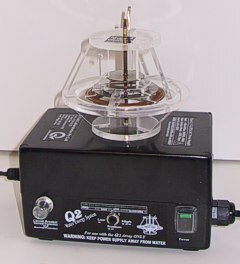 The Q2 machine is a small device that is sunk into a water tub to 'excite' the water molecules. When a body is submerged into this water, the water inside the body's cells get excited by being in proximity with the water outside the cell. This feeds the cell with useful energy. A fully energized cell can now heal itself, multiply, and function better. The generation and absorption of this 'bio-charge' has been shown to increase the potential voltage in a body's cell membranes, which enhances the immune system and helps to maintain cellular function, while at the same time, assists in the elimination of bacterial, viral, and fungal infections. The Q2 System uses water because up to 80% of a human body is water, as is two thirds of the planet covered in it. 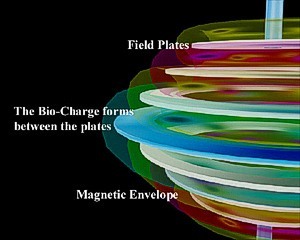 Much research has been done using water as the medium for transferring magnetic field energies. Water can be energized with specific magnetic fields that aid life. What is not widely known is that the water that comes up out of the earth, or is brought up out of the earth, loses its charge after ninety two hours and thus any water having natural magnetic healing properties, such as the water from Lourdes, must be used soon after taking the sample from its source. The Q2, once placed in water, is capable of generating a magnetic bio-field similar to that of a living thing. Every 'body' has its own unique personal bio-signature. When you are immersed in water with a Q2 unit, the bio-charge copies the frequencies already in the water. Once you are in the water, you have activated the array, and it is performing the translation process. The energy is then modulated to configure to 'your' bio-signature. The BEFE Hydro-Therapy System is based on a principle of Bio-Magnetics, which has the potential to relieve many symptoms in a great variety of ailments, thus reducing the associated levels of both mental and physical stress which accompany the illness. This is no modern therapy. The science of magnetic healing has been around for thousands of years in one form or another. For example, lode stones, being basically iron oxide, have the capacity to retain and exhibit a magnetic field. As these lode stones have been charged by the Earth, and thus are harmoniously in tune with the human body's frequencies as well, they have, for thousands of years, been used with great success in the healing arts. The 'healers of old' knew full well the benefits and curative powers of magnetic lode stones when properly placed along the meridian lines of energy of the body. However, with the advance of modern medicine, newer forms of habitats, and man's belief in modern science, chemical substitutes used in place of natural processes has led to a marked decrease in the ability of the body to maintain its magnetic strength and vitality of the bio-field that surrounds it. Man has lost much of the 'back to nature' or naturopathic healing arts. The Q2 delivers a bio-charge to your body's own frequency, which recharges your body's electrical system, realigns your energy field, and allows your body to function better, naturally. improved kidney and liver function. The Q2 System is designed for use by all ages as it has no side effects and is completely safe. The Q2 Water Energy System has been designed and constructed with your utmost safety in mind. The System has been tested by Australian Government Testing Facilities to ensure it complies with both electrical and medical standards. Apart from being constructed to a very high Australian Medical standard, the System features many safety aspects. Double bobbin construction gives double insulation between the primary (AC) and secondary (DC) windings. This means that the AC power stays on the AC side of the circuitry. What this means to you is that there is no direct electrical connection from the main supply to the output. As you can see from the cut away photo of the transformer in your System both the primary and the secondary windings are well separated and insulated for safety.